April 1st, will the start of the 2nd National Journal Writing Month, for 2019. 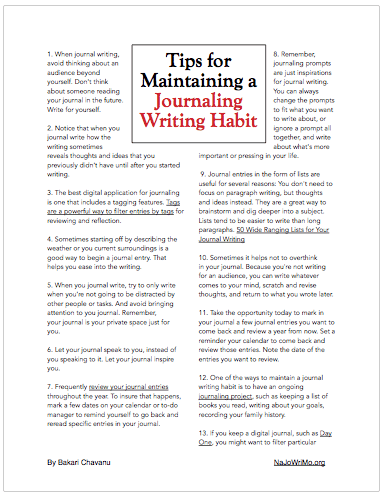 If you’re wanting to develop the habit of journal writing for personal, or if you want to build on your existing habit, April, the time of Personal Renewal (the theme for April NaJoWriMo) is a good month to take on the challenge of 30 days of journal writing. This is the month that you really focus on building and/or strengthening your journal writing. 1. Select your method of journal writing: pen and notebook, digital journaling, an online application, or using Evernote, or your favorite text editor, such as Word or Google Docs—which ever works best for you. 2. You can certainly complete the NaJoWriMo any way you like, but you might want to take a one of three journal writing challenges for the month. For April, the focus of the journal writing prompts will be personal renewal. You are not limited to these prompts. 3. Locate a place to share a few of your journal writing entries with others participating in NaJoWriMo. If you post entries on a blog, please share them in the comment section of NaJoWriMo posts. If so choose, you can participate in NaJoWriMo by taking a thematic journal writing course based on the theme: Personal Renewal Through Journal Writing. Great, Debra. Are you new to journal writing? I ordered a new journal today! I’m looking forward to April! Awesome. Great that you signed up. How long have you been journal writing? I participated last year and definitely had an enlightening time. Looking forward to April 2016! Awesome, Briney. Great to hear you’re taking the challenge again. Thanks for participating. Happy journaling. I’m ready to go! Can’t wait for the prompts, but my sister sent me a Gratitude Journal Prompt as well so I will be doing both. One in my written Journal and one on Day One! I currently use Day One daily, but I look forward to words on paper! Hi Beth, glad you joined up. You can use NaJoWriMo anyway you like. You will receive daily prompts, but don’t feel as though you need to respond to each one of them. You can always be flexible with how you use them. Happy journaling. I’m definitely taking the thematic approach for April 2015 to accompany a self-examination and theology study in my church. So glad you’re holding this again. Thank you, Aimee. I really appreciate your feedback. Keep us posted on how your journaling is going throughout the month.